Stop Manually Importing Your ERD Export into jOOQ – Java, SQL and jOOQ. Great idea! I would like to mention that you can use Vertabelo API to add some extra automation to the whole process. Using API you can build downloading Vertabelo XML file into build process. That sounds awesome! Would be a reasonable extension for a follow-up post. Do you have such a publicly available demo account? I am wondering if the transformation cannot be done more easily in Java with jOOX or jsoup ? I mean that if you often write XSL, it may be ok for you to write this. But it you don’t, the transformation in Java might be a lot easier. Thank you for sharing this anyway ! * Enable access to Vertabelo API (http://www.vertabelo.com/blog/vertabelo-news/vertabelo-api) and share an API key with your readers. Yeah. I’ve forgotten to mention here that Vertabelo API is available only in paid account plans. 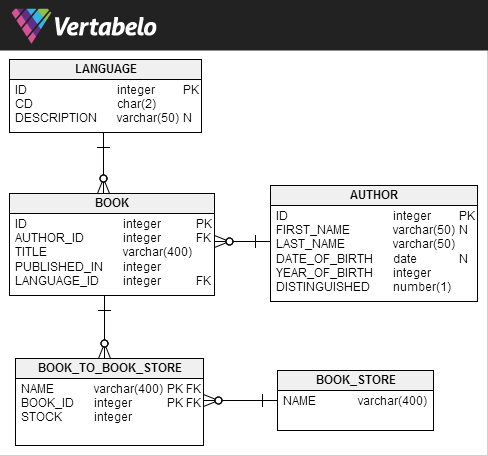 On Vertabelo blog we’ve published article about details of Vertabelo database model XML file format.